COLORADO SPRINGS, Colo. — Standout junior triathletes Maryhelen “Parker” Albright and Drew Shellenberger have been nominated to the 2018 U.S. Youth Olympic Team, pending approval from the United States Olympic Committee. The two up-and-coming athletes qualified on Sunday to represent Team USA in triathlon at the Summer Youth Olympic Games Buenos Aires 2018, which will take place from Oct. 6-18. Albright (Roanoke, Va.) and Shellenberger (Indianapolis, Ind. ), both 16, earned their nominations by virtue of their performances at the CAMTRI Triathlon American YOG Qualifier in Salinas, Ecuador, on Sunday. Albright was the overall champion in the women’s race, covering the 750-meter swim, 20-kilometer bike and 5-kilometer run in 1 hour, 1 minute, 40 seconds. She ran her way to the victory with a race-leading 18:17 5k, edging runner-up Sofia Rodriguez Moreno of Mexico by six seconds. Liberty Ricca (Colorado Springs, Colo.) took third overall with a time of 1:02:26. The men’s race came down to the wire, as the top-three finishers were within eight seconds of each other. Shellenberger made a solo breakaway on the bike and had a 45-second gap on the rest of the field by the second transition. He was caught on the run by Javier Antonio De La Peña Schott of Mexico and Brock Hoel of Canada, but held on for the bronze medal. De La Peña Schott ultimately broke the tape in 57:05, followed by Hoel in 57:08 and Shellenberger in 57:13. The U.S. contingent had a strong showing in Salinas overall, as all eight U.S. women finished in the top-15 and three U.S. men finished in the top-10. As the highest-placing U.S. finishers, Albright and Shellenberger earned the right to represent the U.S. in the third Youth Olympic Games triathlon competition. Athletes in the triathlon events in Buenos Aires will be ages 16-17, and represent National Federations in good standing with the International Triathlon Union. U.S. triathletes have a history of success at the Youth Olympic Games. Kevin McDowell (Phoenix, Ariz.) and Kelly Whitley (Geneva, Ill.) earned silver and bronze, respectively, in the inaugural Youth Olympic Games triathlon in 2010 in Singapore. In 2014 in Nanjing, China, Stephanie Jenks (Aurora, Iowa) raced to a silver medal. Albright and Shellenberger are both decorated triathletes at the youth elite levels. Albright won two consecutive titles at the 2016 and 2017 USA Triathlon Youth Elite National Championships, and finished the 2016 and 2017 seasons atop USA Triathlon’s Youth Elite national rankings. 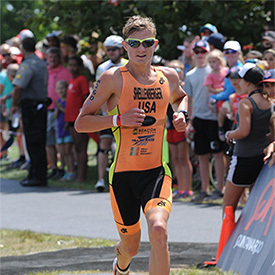 Shellenberger won the Youth Elite National Championships title in 2017, was the runner-up at that race in 2016, and earned back-to-back wins at the 2017 and 2018 USA Triathlon High School National Championships. He was No. 1 in the 2017 USA Triathlon Youth Elite national rankings. Both athletes step up to the junior elite level this year, and they will compete with the nation’s best triathletes ages 16-19 at the USA Triathlon Junior Elite National Championships in West Chester, Ohio, on Aug. 4. To learn more about the Summer Youth Olympic Games Buenos Aires 2018, visit buenosaires2018.com/en.